It takes a motley assortment of vegetables, rice, chicken, spices, etc. and one complete night of cooking to make haleem, one of the most popular dishes of Pakistan. Traditionally, the Shiia community breaks its fast of the 10th of Muharram, also known as the day of Ashura, at around 4pm. According to the tradition, on this day Hazrat Imaam Hussain, along with his comrades and members of his family, was martyred at the hands of Yazid’s army, who had claimed to be the Caliph of the Muslim community. His life was a constant fight against ills, both personal and social. He was used to pushing limits. My relationship with him contributed a lot to my becoming. Now that he is no more, in retrospect, I see him more clearly than I possibly could while he was alive. May be, distance puts things in the right perspective. *Sufism An Alive Tradition: Syed Nazim Ali Nizami, one of the caretakers of the Nizamuddin Auliya shrine and an eminent peace activist, will talk on the subject at Institute for Peace and Secular Studies (IPSS) today at 5:30 pm. *Vijay Prashad will be be delivering a lecture on the history of the Non-Alignment Movement. The lecture will be delivered via skype at Cafe Bol on Wednesday, Dec 7 at 8:00 pm. Winter is here, bringing with it the necessary change of wardrobe. TNS decided to visit various landa bazaars to check out how the common man does it. First up was the rather small landa in Anarkali. Stalls lined the street, with rows upon rows of sweaters and bulky jackets on display. 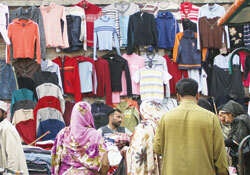 The large sweaters were selling for around Rs.400. Here was one for an adult man, and here one for a newborn baby. 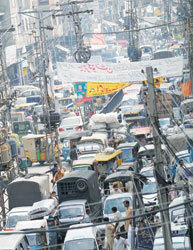 Pakistan’s 37 percent of the population lives in cities where unplanned expansion is creating many kinds of problems. This trend of rapid urbanisation has been accompanied by environmental problems such as air pollution, heavy burden on waste management, congestion, and the destruction of fragile ecosystems. The battle came to be known as the battle of Karbala, named after the field. The army of the Yazid had surrounded the camps of Imaam Hussain since the first of Muharram and they had run short of their supplies. On the 9th of Muharram, all of them gathered and asked each other to bring forth whatever supplies they had, which would then be cooked together. Some people brought lentils, some vegetables, some rice, etc. which was combined and put on fire to be cooked all night on the 9th of Muharram. Early on the 10th, the battle began, resulting in an utter defeat. Finally when the women and children returned after mourning and burying the remains, they had their first proper meal in 10 days at about 4pm in the afternoon, which is why the fast is broken at that time. “The motley of all the ingredients and the product of cooking all night was haleem,” says 60 year old Maryam Ijaz, a devout Shiia by birth, who has been attending majalis all her life. “This is why on the Ashura day haleem is cooked and served.” There isn’t much historical credence behind the story, but one accepts it as part of the culture and tradition. Shiias in different regions of the world all cook different items on the day of Ashura. For example, in Morocco a dish called krishlat is prepared in the evening, using special raisin and nut sweets. In Iran, a dish called shollezard is prepared, all of which would be somehow linked symbolically to the day of Ashura. Whereas haleem is cooked on the day of Ashura, the tradition of giving away niaz continues for the whole two months and eight days, which is the full length of the mourning. Niaz is food prepared and then distributed in honour of some person. The majalis recalling the events of Karbala and the days around it continue for the whole period, however the intensity continues primarily for the first 10 days. There is a Majlis every day which is then concluded by food, called tabarak. There cannot be a majlis without tabarak. 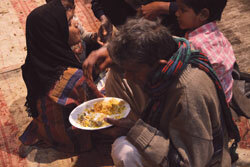 Usually some devotees combine to arrange for food for everyone. “What is served as tabarak usually varies from devotee to devotee,” says 26 year old Asad Murtaza, who is responsible for organising the majlis at the Jain Mandar stop. “Some people serve some lentil, while others bring naan and potato,” he adds. He explains that most of the majalis in the city are being organised for many years now. The oldest one is the one held at Haveli Moti Darwaza, the walled city. “This would be its 258th year,” he says. 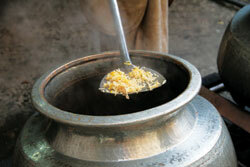 Some of these majalis have tradition of a particular dish for the past many years, which they continue. For example some only serve lentils, while others halwa naan and some haleem. It varies from majlis to majlis. Maryam identifies a peculiar tradition that is followed in some circles of the Shiias. 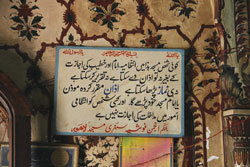 This is the niaz of the 14 masoom or the 14 infallible spirits. These are the 12 Shiite Imaams, Prophet (PBUH) and his daughter Hazrat Fatima. This is given on the night of the 9th Muharram. 14 moti choor ladoo along with 14 bangles are distributed by various people at a majlis. Devotees who are looking for some wish to be fulfilled pick up one of the ladoo along with one bangle. After having the ladoo he/she is supposed to wear the bangle for one whole year. If their wish comes true, then in Muharram next year they are expected to distribute the 14 ladoos along with the bangles. A similar tradition is associated with the cradle of Hazrat Ali Asghar, in which 14 baby kurtas are placed near the cradle and those who want children pick up one. The niaz of the 6th Muharram is in the honour of Hazrat Ali Asghar, the youngest martyr of the battlefield. He was the son of Hazrat Hussain. His cradle is decorated at every majlis and milk is distributed among the devotees. Maryam Ijaz distributes milk with almonds mixed in them every year. On the 7th of Muharram, supply of water from River Euphrates was stopped. According to the tradition, Hazrat Ali Abbas, half brother of Hazrat Hussain was sent to collect water from the river. While on his way back, he was killed by the arrows of the enemy. However, his horse carried the water back to the camp and the children could drink. Following this tradition, on the 7th of Muharram, water is distributed to the devotees in a mushk, a leather bag meant to carry water, to the devotees, in memory of Hazrat Ali Abbas. Food for any religious group and gathering plays an important role. Prasad in Hindu temples and Sikh Gurdwaras is an integral part of the religious ceremonies. Similarly, the holy water and wafer are to be consumed by all at a congregation in Church during the Sunday Easter ceremony. The niaz at a Shiia majlis serves a similar purpose. Whereas there is no religious compulsion to partake this langar, it is considered disrespectful to say no to niaz. It was 9:15 am, September, 2005. We were told a day before that new teacher was to take our Political Philosophy class. We were also instructed not to get late for the first class, as was our wont. As expected, we could not manage it at nine sharp! The moment we (my classmate Mazahir and I) reached the Bokhari Auditorium stairs in Government College, we saw a young scholarly young man, walking to and fro restlessly. We guessed it was Bilal Sahab. While puffing at his cigarette, he looked at us and then at his wrist watch. Without a word, we followed him into the classroom. A short-statured man with big sparkling eyes and a cigarette in the mouth, this was our first encounter with Sir Bilal Ahmed who looked like an oxymoronic refined-hippie. With no formal introduction, he started talking. Without any conscious effort, we were smoothly drawn into a discussion. At the end of the class, he had established his authority as a teacher, despite his obvious frankness and treating us as his equals (friends). Having been brought up in a traditional academic set-up, it took me a while to get used to his method of teaching. He would let us speak as much as he would himself. The air of non-conformity around him put us on guard. It was the second or third day that he took us to the university café to teach his class. Over sips of tea, we learned more than we did in the classroom. In no time, he completely won us over. 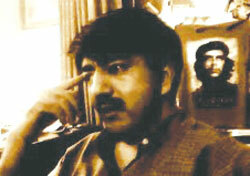 He commanded respect as an ideal teacher and was dear as a fun-loving friend. The classes were anything but boring. Talking philosophy was a luxury now; the mental energy-sapping objectivity and dryness went away. His way of unconventional teaching broke our inhibitions and we shared both academic and ‘not so academic’ issues with him. He was as accessible as a very frank friend, yet as far away as necessary to make us understand the delicate points. His subtlety smoothed the rough edges of our personality. At the end of the session, he invited us to his home for dinner. It was a different person — more caring than he was at the university. He served us with delicious food and elevating liquids. This set in a new level of relationship and understanding with him. I don’t know if I pulled myself up or he usually jumped his level, his was a thoroughly enjoyable company – intellectually stimulating and socially refining. In four or five years that followed, we met now and then, mostly at the varsity. During this time, I discovered the other sides of his personality — his anti-authoritarianism, his love for art and literature and his other personals issues which turned him into a wonderful human being. All his scathing criticism he garbed in a rare sense of humour. If other’s criticism of my teacher-novelist’s writing often made me angry, his terming my favourite Urdu novel “a voluminous piece which has added to the pollution” did not hit me so hard. Last year, he taught us a semester. Though his health had gotten worse, he would still come as the campus made him alive. My MPhil class fellows’ perception that I would get good marks in his paper despite my short attendance proved wrong when I was among the students getting a poor score. He tried his best not to let his personal matters defy the values he cherished. Since the last couple of months, he was not coming to the department. He was conspicuous through his prolonged absence. We came to know that he was so ill that he had to be admitted to the ICU. He was only clinically alive for about a month. Our apprehension proved true this time. An SMS from an unknown number came, “Sir Bilal is no more.” After all, he was relieved of the pain he had been going through for so long! A very beautiful, loving being was no more among us; this society lost another voice of reason. His body was lying there, wrapped in coffin. Everyone was talking about what he had been to them. There were also voices, whispers echoing fears about the possible fallout of the ‘memo issue’, and whether Imran Khan was supported by the establishment or not. If my teacher, my friend, was there, he would have loved to reply in his considered, objective and low, sweet tone. on Dec 9 at 4:30 pm. *Exhibition titled Margin by Vasl Artists’ Collective Lahore in collaboration with Rohtas 2. Today is the last day of the exhibition. *Works by Graduating class of Fatima Jinnah Women University curated by Aasim Akhtar. Exhibition continues till Dec 6. *Weekend Cycle Ride to start from Zakir Tikka restaurant at 10:30 am today. The group wants to head out this week to Jallo Park side. First up was the rather small landa in Anarkali. Stalls lined the street, with rows upon rows of sweaters and bulky jackets on display. The large sweaters were selling for around Rs.400. Here was one for an adult man, and here one for a newborn baby. In fact, the variety of stripes, and the different colours of sweaters and jackets at one stall was downright overwhelming. The labels Adidas, Puma, Dolce & Gabbana and Levi’s were begging to be read. One stall was packed with jeans of all kinds — ripped, glazed and acid washed, bearing the labels ‘Levi’s Skinny’, ‘Levi’s Slim fit’, ‘Levi’s Snug’ etc. Suddenly, ‘affordable brands’ wasn’t just an oxymoron. All of the stall-keepers there carried large wooden sticks. When you inquired about something high up, they would use the hook at the stick’s end to ensnare the hanger and bring it down. The landa bazaar next to Mayo Hospital was rather similar: rehris lined the street, while medical supplies’ shops were at the other end. There was a shaving booth cramped between two hard-at-work salesmen’s territory. The atmosphere here, though, was rowdier as a salesman shouted out ‘Wee, wee, wee rupey’ (Rs. 20) as he held up a child’s sweater with a cartoon on it. The heaps on the rehris were just that — heaps — and, at first glance, seemed quite unappealing. It was only when I saw a man holding a cute little purple skirt and small shirts, presumably for his children, that I realised that one would need the knack of picking well here to truly have a successful shopping spree: he had bought 6 shirts, 2 jeans and a skirt within Rs. 500. I spotted a few men striding quickly, and balancing heaps of jeans and sweaters on their shoulders — it was new stock. Seeing women’s undergarments hanging out in the open was surprising, if not shocking, considering our conservative country. A satin camisole was selling for Rs.80 and the shopkeeper wasn’t having any bargaining: “Eighty bata raha hoon, forty nahin” (“I’m saying 80, would not make it 40”). I was told the prices would rise as we would go further into the bazaar; now there were small shops on both sides, with names written in Urdu. I stood in ‘Ali Variety Shop’ that sold women’s sweaters. The shopkeeper assured me, while announcing the ‘Next’ label, that the brown sweater was new, and then explained “Ziada nahin pehna giya.” It would be mine for Rs. 700. Dressed mannequins hung on the walls. One was clothed in a purple velvet dress with spaghetti straps. Such dresses aren’t worn here — no wonder then that stories abound of people buying things in landa cheaply only to reopen them and make something else of the cloth. It’s as good as new, after all! There were more shops on the right. About fifty ties hung on a hanger — a silk one had the label ‘Burton,’ and it was for a mere Rs.20. A table had uncountable socks of all colours. At a closer glance, they seemed quite worn out. Further ahead, shoes were being sold. Most of their soles had been removed, though, on one, the name of a foreign brand was half visible. Not more than a yard further, men were washing shoes in a large tub full of soapy water. Nearby, hoping to take advantage of the ladies tired from shopping, a chanae wala stood. His cart was emitting smoke which quickly filled the cramped space. I followed a motorcycle down a sloping lane and, after going down a steep stone staircase, came to a large whitewashed shop, which was one of many. On the floor were mounds of laces. A woman sat on one such pile, holding a piece, and remonstrating with the shopkeeper about the price. He soon told her that he: ‘took it off the curtain, and threw the rest.’ Net laces were spilling gracefully out of jute bags. Some had hundreds of pieces of the same lace stuffed in them, while others were jumbled, forming a beautiful colourful mess. There were also neck design pieces of all kinds and sizes, which the shopkeeper told me were bought by boutiques. One seemed tiny enough to go on a newborn’s dress. Another shopkeeper was selling red frocks from Japan with very fine flower designs embroidered on it for Rs.100. There was a delicate brown scarf in his hand, which he told me he had just bought; now he was looking for cloth to make a matching shirt. Eventually, I reached a shop selling white wedding gowns — some had intricate netting while others were beaded. I climbed the rickety step, and noticed that one of them had yellow stains on the bodice. On the far end, red and blue green wedding lehngas were on display. The former was for Rs.2500. Now I was outside, and, as night was fast approaching, the whole crowd was moving towards the main road. I joined the human tsunami, hoping that everyone surrounding me would look back at the day’s buying and selling with satisfaction. Breathing is the first requirement of life and polluted air is certainly detrimental to health. Issue of air pollution in most mega cities is worsening day by day due to ever increasing sources of pollutants like vehicular exhaust emitting poisonous gases in air and domestic and industrial waste. Everybody who has a car or motorbike, uses his own transport which seems irreplaceable. Only an efficient and decent public transport system which saves people’s time and does not transport them like cattle can reduce the rush on road. The density of motor vehicles is directly proportional to the concentration of motor exhaust, worsening at the time of traffic jams. All these emissions are causing severe damage to the environment. Clear blue sky is never seen above cities. Smoke causes common visibility problems in urban areas. The pollutants once released in the air are inhaled by humans. They enter in the blood stream and reach all parts of the body. They can cause variety of negative health effects like headache, fatigue, respiratory tract disorders, eye irritation, hearing impairment, mental stress and behavioural problems. According to Economic Survey of Pakistan one of the main cause of air pollution includes increasing number of vehicles with inefficient and out dated automotive technology, dirty fuels and absence of effective public transport system. Motorcycles and rickshaws, due to their two stroke engines, are most inefficient in burning fuel and contribute most to emissions. Two stroke vehicles are responsible for emission of very fine particles that settle in lungs and cause respiratory diseases. The 2-stroke vehicles industry is expanding fast in Pakistan and has increased by 142.6 percent in 2010-11 as compared to 2000-01. Rickshaws have grown by 24 percent while motorcycles and scooters have more than doubled since 2000-01. Unplanned and rapid urbanisation in these cities have increased the demand of motor vehicles manifold, particularly at school and office timings. The concentration of motor vehicular exhaust touches its peaks during these hours. Till June 2009 registered number of vehicles was 6.47 lakh. Punjab has 4.37 lakh motorcycles and 154,901 auto rickshaws. To control air pollution the government adopted Legislative control Euro-II motor vehicles emissions standards in July 2009 for petrol run vehicles and these standards shall be applicable to all including diesel run vehicles effective from July 2012. Ministry of Environment has made first pilot project to examine vehicular emission at a cost of Rs. 294 million. Motor vehicles centres will be established later with the help of public private partnerships throughout the country. While there are 3329 CNG stations operating nationwide fueling 2.50 million vehicles, the three day CNG holiday poses much inconvenience and raises many questions. The government banned production of old two stroke rickshaws and introduced 4 stroke engine rickshaws but again the CNG holidays have hit them hard. Ministry of Petroleum and Natural Resources has been given a task to improve fuel quality to international standards like diesel with 0.05-0.5% sulphur content instead of 0.2 to 0.6% till January 2012. As CNG availability is a big issue in the country, setting up motor vehicles examination laboratories according to Euro-II standards on district level is not the answer. When the government can’t provide the vehicles clean fuel (CNG) how can it expect them to be fit. Only in Lahore over 80,000 rickshaws are running on roads but what would be the use of converting them into 4-stroke engine when government can’t provide CNG. A good system of metro buses and urban rails can minimise public reliance on personal transport sources. For goods transportation nationwide rail network needs to be re-engineered as heavy loads can be transported efficiently and economically using locomotives. There is need to build lanes for cyclists and paths for pedestrians along urban roads to encourage people to use cycles and walk where possible. Keeping in view all circumstances there is dire need to set targets of lowest emissions not only to cut levels to lowest but to eliminate polluting sources. Zero emission concept need to be applied in big metropolitan cities where pollution is a silent killer. That will not only save environment, health but high foreign exchange incurred to procure fuel. Wide roads filled end to end by ever-increasing vehicles in the city.